Turner Sims presents an exhibition of works by the London based artist Andy Bannister made over the last three years, including an artwork that was recently commissioned by the concert pianist Cordelia Williams for the cover of her new CD on Somm Recordings. The commissioned piece was made in response to the compositions by J.S. Bach and Arvo Pärt that feature on the CD. As well as representing a subjective response to these pieces the design reflects Bannister’s interest in principles of geometry and their relation to notions of musical harmony, aesthetic value and the structures of the natural world. It is shown in the exhibition alongside a collection of research images- presented as a kind of ‘visual essay’- that relate to its development and creation. The other works on display reflect Bannister’s on-going research into the history and culture of the Cold War era. His meticulous pencil drawings rework photographs that record significant developments within atomic science and nuclear technology from the time of the Second World War onwards; in recreating and modifying these images, he reflects on their latent meaning and the material form of the artefacts that they depict. The exhibition also includes two framed digital drawings depicting playground climbing frames from the late 1960’s and the early 1980’s. 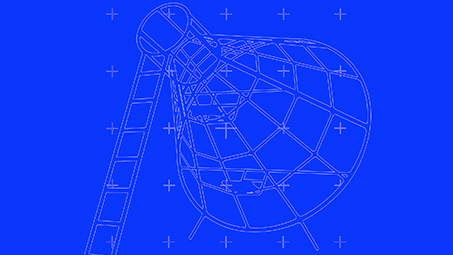 Rendered in white lines on blank, ‘chroma key’ blue backgrounds these are combined with visual calibration and measuring devices relating to aerial warfare simulation and the NASA Apollo missions. The works are an exploration of how the designs of these play structures correspond to the sense of anxiety and optimism that characterised this time. A launch event will take place at Turner Sims on Tuesday 9 October to mark the release of the CD on Somm Recordings. This will feature a piano recital by Cordelia Williams (8pm), a pre-concert talk by Peter Bouteneff (7pm) a CD signing and a private view of the exhibition (9-10pm). Andy Bannister studied fine art at Nottingham Polytechnic and Chelsea College of Art, graduating from the MA sculpture course in 1992. Recent group shows include the Jerwood Drawing Prize 2017 exhibition, New Relics at Thames-side Studios Gallery London and the inaugural Trinity Buoy Wharf Drawing Prize exhibition, both 2018. He has worked in higher education since 1993 and is currently a senior tutor in fine art at City & Guilds of London Art School. We invite you to play your part in this important moment in our history by donating to The Ruby Campaign.